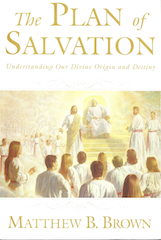 In The Plan of Salvation LDS author Matthew B. Brown provides his audience with an appendix “designed to direct the reader to information on the LDS view of salvation and grace.” Included (among other things) are four pages of helpful quotations from prominent LDS leaders. Here are some excerpts from Mr. Brown’s Appendix III. That salvation is by grace, through faith, a gift of God, not a result of works (Ephesians 2:8-9). That a person is not justified by works of the law, but [rather] through faith in Christ (Galatians 2:15). That there is a juxtaposition of law and faith: blessed are those who rely on faith, cursed are those who rely on law (Galatians 3:7-12). That works and grace for salvation cannot co-exist; one overturns the other (Romans 11:6). That those who seek justification by the law have fallen from grace and are severed from Christ (Galatians 5:4). How does one get from these teachings in Romans, Ephesians and Galatians to the assertion that Paul teaches “salvation by grace through faith, through obedience, through accepting Christ, through keeping the commandments”? The Bible does not reject the role of good works in a Christian’s life altogether, for we are God’s workmanship, created in Christ Jesus for good works (Ephesians 2:10). Yet these works are evidence of our faith; evidence that we have been saved by grace through faith, a gift of God, not a result of works. In the end, it is Mormonism or the Bible – the two cannot be reconciled. This entry was posted in Salvation and tagged Bruce R. McConkie, David O. McKay, Ezra Taft Benson, Grace, Matthew B. Brown, Orson F. Whitney, Salvation, Spencer W. Kimball. Bookmark the permalink. So, 2 Peter 3:15-18, NKJV, says, 15 Paul, according to the wisdom given to him, has written to you, 16 as also in all his epistles, speaking in them of these things, in which are some things hard to understand, which untaught and unstable people twist to their own destruction, as they do also the rest of the Scriptures. 17 You therefore, beloved, since you know this beforehand, beware lest you also fall from your own steadfastness, being led away with the error of the wicked; 18 but grow in the grace and knowledge of our Lord and Savior Jesus Christ. To Him be the glory both now and forever. Amen. The 2 Peter 2:1-3 passage says, 1 But there were also false prophets among the people, even as there will be false teachers among you, who will secretly bring in destructive heresies, even denying the Lord who bought them, and bring on themselves swift destruction. 2 And many will follow their destructive ways, because of whom the way of truth will be blasphemed. 3 By covetousness they will exploit you with deceptive words; for a long time their judgment has not been idle, and their destruction does not slumber. Both are great Bible passages regarding false prophets; and, of course, the 2 Peter 3:15-18 passage specifically addresses those who criticized the Pauline epistles and shows that the Pauline epistles were already regarded as Scripture. * NKJV Copyright © 1982 by Thomas Nelson, Inc.